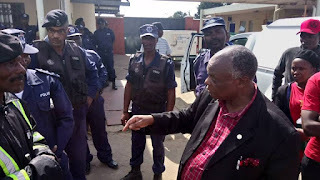 PUDEMO President Mario Masuku stopped by police at the Swaziland border. Leaders of Swaziland’s political opposition were stopped from crossing the border into South Africa to join a protest against the holding of political prisoners. The People’s United Democratic Movement (PUDEMO) said police told them that an order to bar them from crossing the border had been issued but did not say by who and how it was drafted. The Observer on Saturday newspaper in Swaziland reported those stopped had authentic travelling documents. 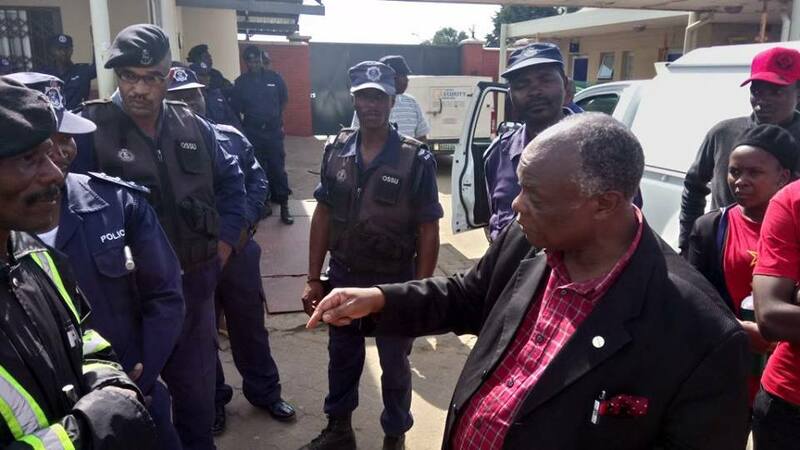 PUDEMO President Mario Masuku was among those stopped at the Ngwenya border crossing on Friday (11 May 2018). On the other side at Oshoek about 300 South African trade unionists and others had assembled to protest the imprisonment in Swaziland of Amos Mbedzi and other political prisoners. PUDEMO is banned in Swaziland where King Mswati III rules as sub-Saharan Africa’s last absolute monarch, and political parties cannot contest elections. Mbedzi, a South African, was sentenced to 85 years and six months in jail (with 25 years to be served) in Swaziland in 2012 after conviction by the Swaziland High Court on five charges including sedition and murder. There was heavy police presence at the border while the protests went on the other side for about two hours. Meetings on all topics are routinely banned in Swaziland. In 2013, the Open Society Initiative for Southern Africa (OSISA) reported that Swaziland was becoming a police and military state. It said things had become so bad in the kingdom that police were unable to accept that peaceful political and social dissent was a vital element of a healthy democratic process, and should not be viewed as a crime. These complaints were made by OSISA at an African Commission on Human and Peoples’ Rights (ACHPR) meeting in The Gambia in April 2013. As recently as September 2017, police stopped a pro-democracy meeting taking place, saying they had not given organisers permission to meet. It happened during a Global Week of Action for democracy in the kingdom. About 100 people reportedly intended to meet at the Mater Dolorosa School in the kingdom’s capital, Mbabane. In 2011, a group using Facebook, called for an uprising to depose the King. State forces took this call seriously and many prodemocracy leaders were arrested. Police and security forces prevented people from travelling into towns and cities to take part in demonstrations. Again, the protests were abandoned.